Jost, Jon, “Out of Context: Some Thoughts on ‘Independence’,” pp. 2-14. Hoolboom, Mike, “The Psychotechnology of Everyday Life,” pp. 16-24. Savedoff, Barbara, “L’Atalante, the Marriage of Music and Image,” pp.26-35. Lynch, Joan Driscoll, “Book of Days, An Anthology of Monkwork,” pp.38-47. 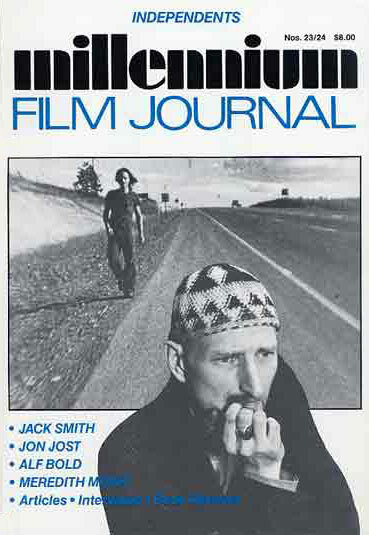 Reisman, David, “In the Grip of the Lobster: Jack Smith Remembered,” pp. 60-85. Brinckmann, Noll, “The Art of Programming: An Interview with Alf Bold, July 1989,” pp. 86-100. English, William, “Three Aspects of French Experimental Film: Interviews with Yann Beauvais and Rose Lowder and Alain-Alcide Sudre,” pp. 102-116. Ravett, Abraham and Grahame Weinbren, “Raking Leaves: Photos, Drawings, Frame Blow-Ups, Working Notes, and Texts from Everything’s for You,” pp. 118-27. Binkley, Timothy, “Postmodern Torrents: Review of Margot Lovejoy’s Post-Modern Currents: Art and Artists in the Age of Electronic Media,” pp. 130-41. Macdonald, Scott, “Cinema Before Film: Review of The Shows of London by Richard D. Altick,” pp. 142-53.